After this last week, I discovered that I'm not too great at making lunches as you'll see in my summary of this lunch challenge week. My lunch-making ability pretty much fell apart toward the end of the week. Monday: Day one was a success; it was easy to prepare and everyone loved the meal. I prepped oven chicken strips the night before and popped them in the oven right when we got home. They were done in 30 minutes and delicious as usual. 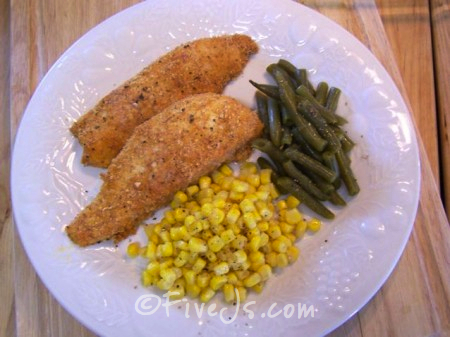 I followed this recipe from The Happy Housewife but used boneless/skinless chicken instead. Tuesday: I got ambitious and made breakfast and lunch on Tuesday. Breakfast was peanut butter and chocolate chip baked oatmeal, our family's new favorite (with the exception of Jaden who still says he doesn't like chocolate and peanut butter together). 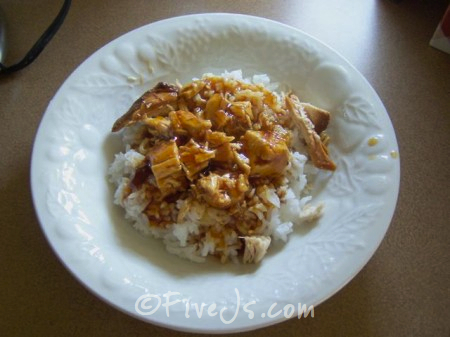 Then for lunch we had crock pot sweet and sour chicken, with the sauce from a bottle. It turned out only so-so becuase the sauce wasn't that good. 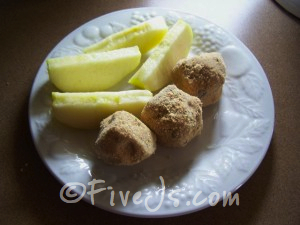 Wednesday: Day three was a hit again with the girls: peanut butter and chocolate protein balls with apple slices. Jaden again fixed his own lunch. I was reminded when I was making this recipe how easy they are to make, so I think I'll be putting this on my regular rotation. Thursday: I make deli tortilla wraps for day four, and although when they were eaten I didn't hear any rave reviews from the kids, Joely did ask me the next day if I could make them again, so she apparently liked them a lot. Unfortunately I had to tell that we were out of the lunch meat so I couldn't oblige. Friday and Saturday: This is where my lunch challenge fell apart. Lunch Friday was Sonic, and we ate peanut butter and chocolate baked oatmeal for practically all three meals on Saturday. You can read about my very busy weekend for a detailed explanation of my lunch-making failure. Sunday: Today I didn't plan a meal at all since we had a hamburger and hot dog lunch at church today. Now here's where you can take part in the lunch challenge. I could use a lot of help when it comes to planning quick and easy lunches, so I'd love to see what some of your favorite lunch recipes are. Link up with your recipes below or leave a comment. 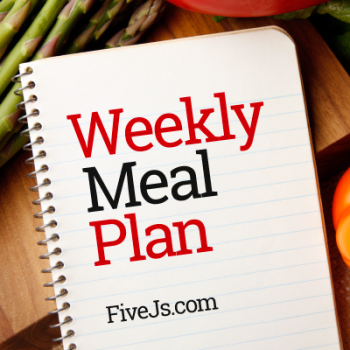 Amanda and I would love to be able to add some tried-and-true lunch recipes to our master menu plan at the end of June. If you didn't get a chance yet, you can also link up your breakfast recipes here. Hello. My Name is Joy, and I'm a Chocoholic. um. i just put my name and url in up there above the comment section and i have no idea what that was for. wasnt paying attention. oops. anyways… today for lunch i made something super simple. i took flatbread, drizzled it with olive oil and sprinkled some garlic salt and parsley over it. added some grated cheese and chicken slices i had prepared the day before (i made extra for this purpose) then i stuck them under the broiler til they were hot and bubbly. its kinda like a pizza w/out red sauce, i guess. everyone loved them! serve it with fresh fruit. I just did some rambling about how we handle lunch at our place. It's always been one of my bigger menu-planning challenges. Keep on keeping on!